This is a detailed category regarding my quest to make homemade bacon. YUM!!! 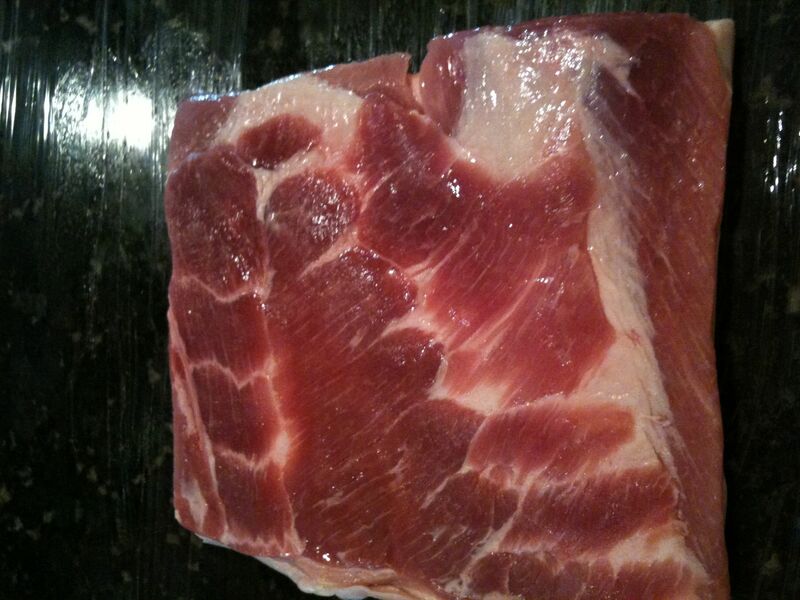 2/4/2013 is the date that I will be teaching the art of making bacon to a group of culinary students. Yes I am going to be teaching young minds the art of Charcuterie. Or to quote Darth Vader, “The circle is now complete. When I left you I was but the learner and now I am the Master.” I know the quote is a stretch in this case, but I do not often get the chance to quote Star Wars. You may also ask why I, Jeff Kukral, have been asked to help mold the minds of the youth. My only answer is…because my bacon and other meats is to freaking die for. 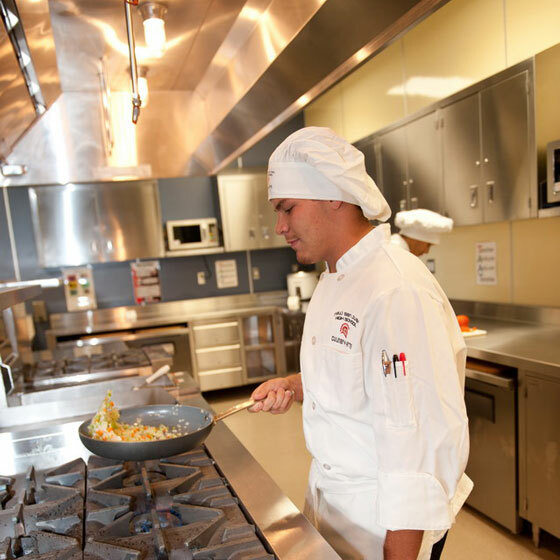 The great teacher at San Juan High School Culinary Academy recognizes awesomeness and thinks a guest teacher is just what her kids need. I am going to teach there!!!! I am so very excited. 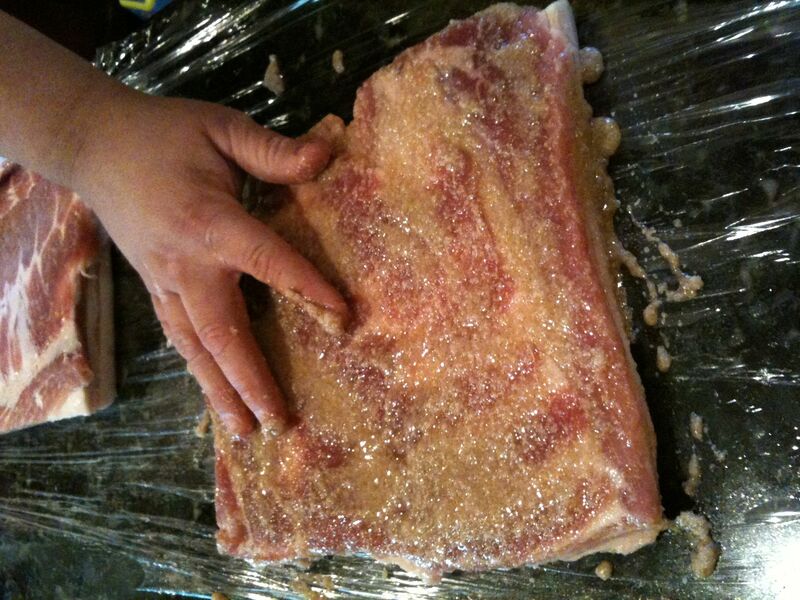 For about three hours I will be able to teach the kids how to brine the pork belly and how the process works. I get to teach them how the “pink salt” kills pathogens like Botulism and how sea salt brings out moisture and then it gets sucked back into the meat. 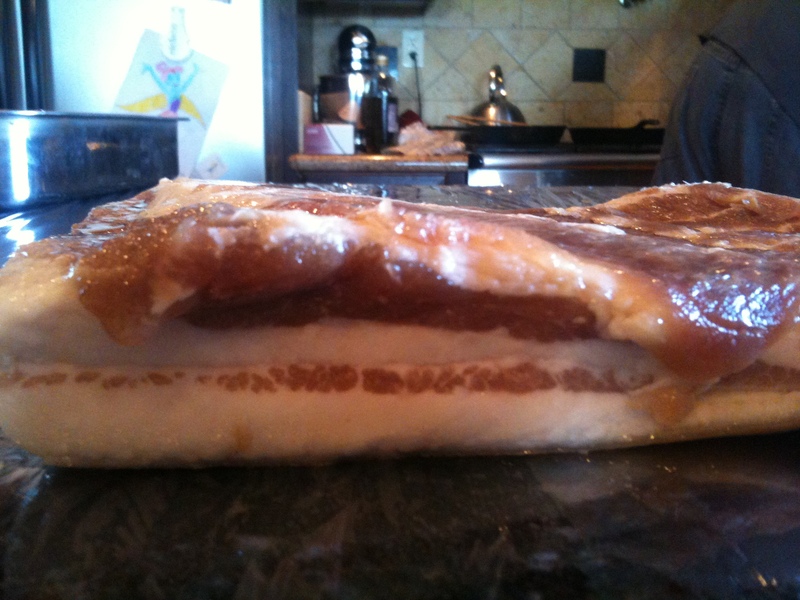 So far the plan is that I will have three slabs of pork belly in various stages of the curing process. The 1st one will be one without the cure and the lesson will be the art of mixing the salts and then spreading them over the belly. The next will be about half way through the process. Letting the kids see and feel this will show them how the cure changes the belly and turns it into bacon. 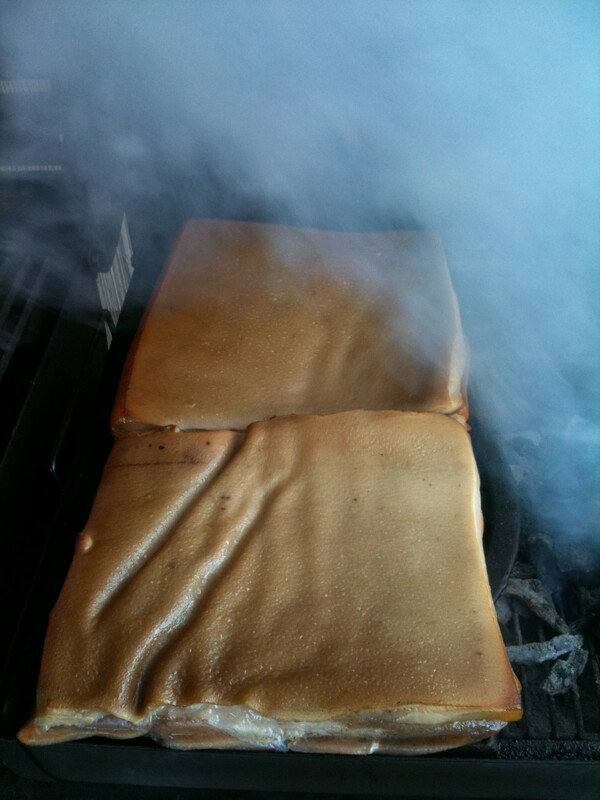 Finally the goal is to have a slab in the smoker and at the end allow the kids to taste a fresh smoked slab. How freaking exciting is this. I am just so excited about this opportunity and I would like to thank Sandi and the Culinary Academy. 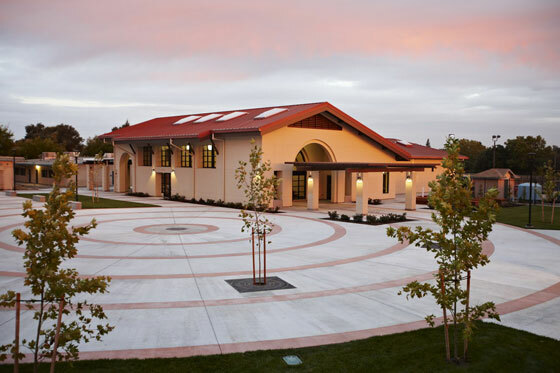 Please take a moment and learn more about this wonderful school and the Culinary Pathway within it. So Makin Bacon was a success. Clean and simple. 8 days of love and I still have a ton of left overs. Sunday was my Mother In Law’s birthday and she wanted a brunch. Nikki was tasked with making homemade chocolate croissants. They came out great. And I volunteered to have my bacon ready. So Sunday came and it was the day to start. My first project; a project of love. Really, I started this 8 days before I smoke the meat. I defrosted it and rubbed it with salt so it could cure and dry in my fridge. I am not as patient as I would like to be, so waiting 8 days was hard. But I was able to do it. I set my alarm for 6:30 and got up at 7:00am. Went outside to get my upright smoker going. I got a bunch of coals nice and hot and I put it in the smoker. 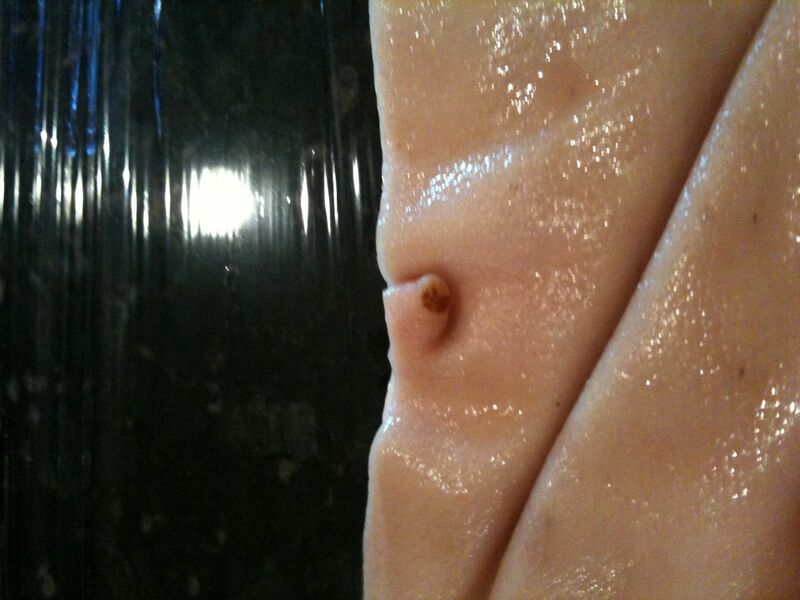 I left it to go get the pork ready. Come back outside about 20 min later and the smoker is still stupid cold. I was like WTF. I added some more coals and waited…and waited…and waited. It was not getting hot at all. So I had to think up a plan B. Plan B: USE MY BBQ. I have an awesome BBQ. The left side is for propane while the right is for charcoal. I took off half the grate on the right side and put my coals there. As you can see in the picture above I was able to get both slabs of bacon on the single grate. I did not go all out in the marinade and the rosemary. For my marinade (it goes in the bowl under the meat to help steam it) I used a bottle of Guinness beer and maple syrup. For my wood smoke I used both cherry chunks and chips. I like using both as the chucks go longer, but the chips get me a pretty immediate smoke. AND I LIKE SMOKE. So 2+ hours on the grill and the meat hits the ideal internal temp, 150. I brought the two slabs off and allowed them to rest. Now mind you, the meat was not ready to eat. Yes, technically one could eat it because the temp was at the safe level but slicing off a piece and placing it in my cast iron was the best way to finish it off. It got a little char on it and when I put it in my mouth I got a FOODGASM. Yes, I had never tasted any better piece of bacon ever. It was just so rich and satisfying. Plus I knew what was in it and actually it was probably better for someone as there was less chemicals in it. I have 3ooz of bacon left ready to fry up and a whole other slab in the freezer. Now I paid $28.00 for the two pork bellies. I got basically 6 pounds of bacon. That is about $4.66 per pound. At Trader Joes I think it is around $5.50 for 12oz of bacon and it is a whole lot more at the other stores. Not only did I save money. I had a lot of fun, made something with skill and artistry, and made people smile when they tasted it. Here you will see 1 complete slab and half another cut into slices. Right out of the brine and into the fridge to dry. 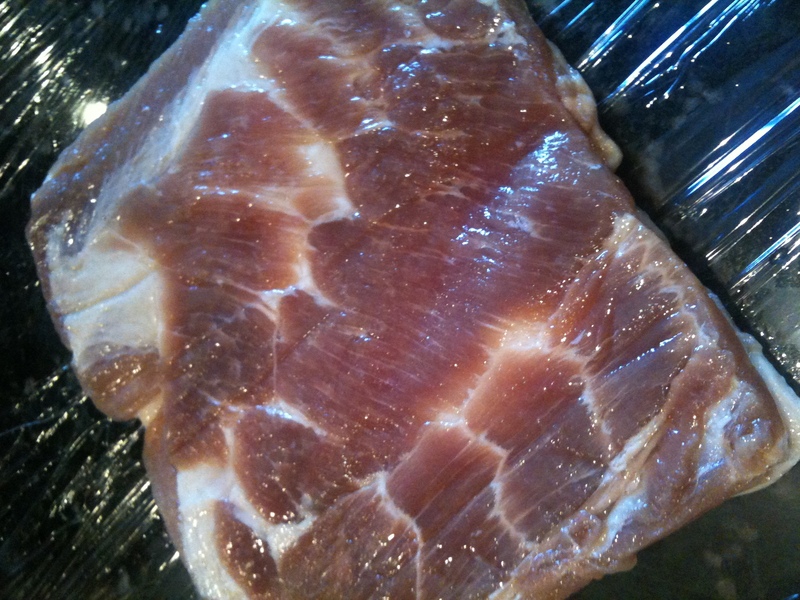 Tomorrow morning I will cook some of the best tasting bacon that was ever made. 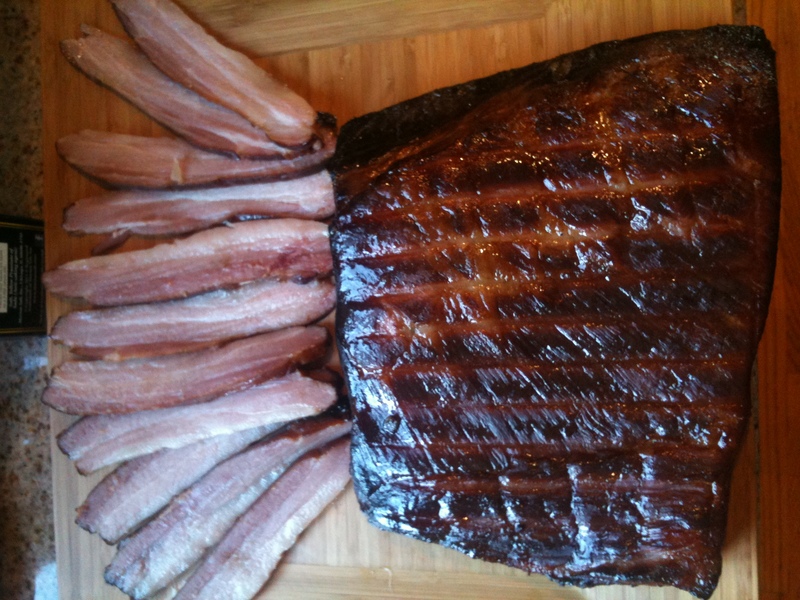 Who does not love bacon…really I dare you to come forward and say you don’t like bacon. If you do come forward, I won’t believe you. 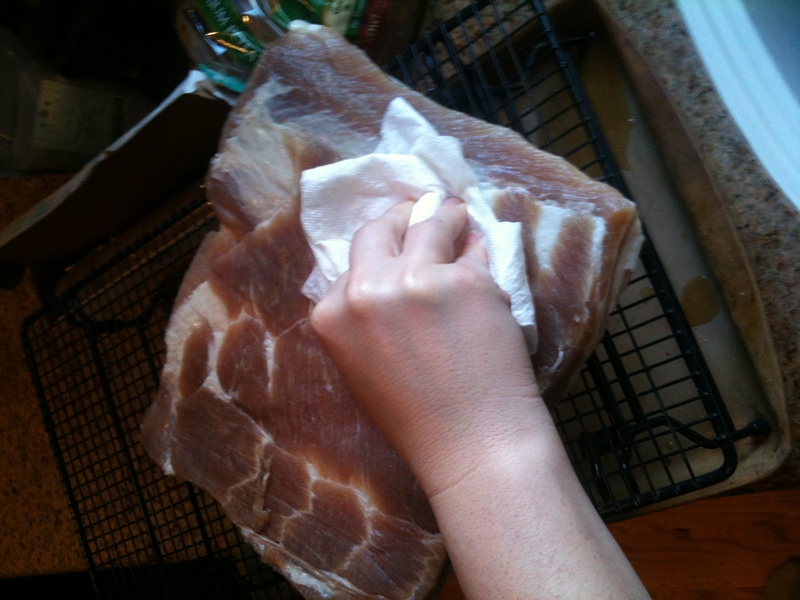 So today Nikki and I took the bacon out of its bags and rinsed the slabs and dried them. The next step is to leave them out in the fridge for 12-24 hours to dry. I can not wait the 24 hours, but it will be close enough. Tomorrow morning I am going to get up around 7:00am and start a nice little fire in my smoker. Using cherry chunks and natural charcoal as the fire source and a maple and coke marinade I am going to smoke the bacon for about 3 hours. I like using coke in my marinade because it seems to boil off a little slower and I like the hint of cola that it imparts in the smoke. I think that this mixed with maple syrup will produce a wonderful moist smoke to stick to the bacon. I have a little trick I am going to try. Right before I take off the bacon to bring it in and fry it up, I am going to put well soaked rosemary on the coals. This should produce a very thick smoke that will help infuse the meat with the oils from the fresh rosemary. Now I know that you all will want to come over and taste. This would be great, but I only have so much.